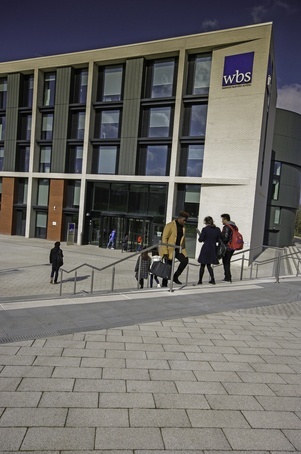 Churchman Landscape Architects contracted Hardscape Products to supply paving and kerbs for a project to reconfigure and improve the University of Warwick’s Business School and Central Plaza. Upgrading the Central Plaza was central to a 2009 masterplan approved by Coventry City Council which sought to facilitate meaningful and co-ordinated expansion of the whole campus. The university has grown substantially over the last 10 years with completion of the Sherborne Residences in 2012 and the completion of Phase 3 of the Business School in 2014.. 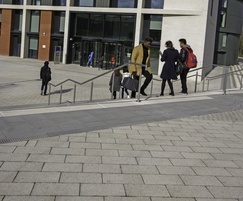 The designers were looking for paving to echo the white tile facades of the early 1960’s academic buildings which are specific to the Warwick campus, creating a unique identity and modern feel to the University’s landscape and public space. The steps on the scheme stand out vividly. The designers wanted to place these steps on various levels and to create some measure of depth. Hardscape Products worked easily with Churchman Landscape Architects to meet the brief, as they understood and shared the same need to supply immaculate and precise hard landscaping materials. Hardscape Products manufactured and supplied materials, fixtures and fittings that would connect with future projects.